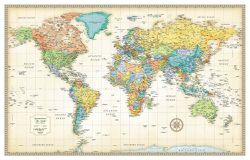 The Rand McNally Antique Style World Map is a very attractive up-to-date political world map printed in an old world map style. The muted color tones and a decorative border make this antique style world map ideal for decoration AND reference! Item Number Paper or Laminated Price Qty.